From time to time, you may discover duplicate Giver records in your database. 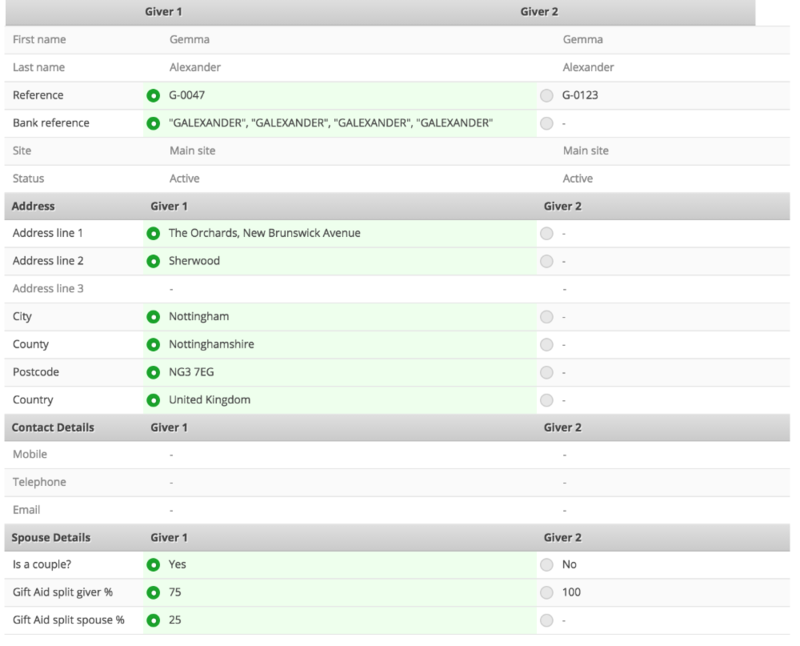 Ordinarily these can be identified using the Duplicate Givers report in the Giving module Data Cleansing reports. Additionally, when viewing a Giver's profile page, you might also see an Information message alerting you to a potential duplicate Giver. In both instances you have the option to Merge duplicate Givers. How does Giver Merge work? Select "[Merge Givers]" on the Giver profile page (shown above), or select the "Merge X with Y" button in the Duplicate Givers report (shown below). The Merge page opens, showing the Giver 1 on the left and the duplicate Giver on the right (Giver 2). During the merge process, all information (Tags and other linked data) will be merged into Giver 1 and be retained. Giver 2 will be deleted. Scrolling down the page and working methodically through each section, you can choose which elements of Giver 1 or Giver 2 are to be merged and retained - simply select the radio button against the respective entry. Note that it is not possible to choose not to merge one or more elements of linked data e.g., you cannot not merge Tags - all Tags for Giver 2 will be merged into Giver 1. When you are happy that radio buttons have been selected for all the data to be retained, select "Save Changes" to complete the merge process. Giver 1 will be retained with all the fields of data selected and Giver 2 will be deleted. A note of the merge is added against the Giver's "Recent Activity" log to indicate the contact has been merged; including the date, and the User that performed the merge operation. Beyond the radio button options provided in the Merge page, the following additional data is also merged (retained). Notes - including any Note restrictions (e.g. restricted to "Just Me" or a particular User Group). Giving - If Giver 1 has a linked Giver profile, that link is retained. If Giver 2 has a linked Giver profile but Giver 1 does not, Giver 2's link is retained. If both Giver profiles have different linked contacts, the Giver 1 link only is retained. Multi-site - A radio option is available to select which Site the merged contact is added to (if the Site of Giver 1 and 2 is different). Q: Can I undo a merge? A: No. Once the merge is completed, Giver 2 (the one on the right) is deleted from your database and only Giver 1 (along with all the fields of data selected for retention) is kept. Deleted Givers cannot be reinstated.